Hello there! I hope you’re enjoying your weekend so far 🙂 I thought I would pop by with these cards that I have made using a new stamp and co-ordinating die set from Clearly Besotted called English Rose. 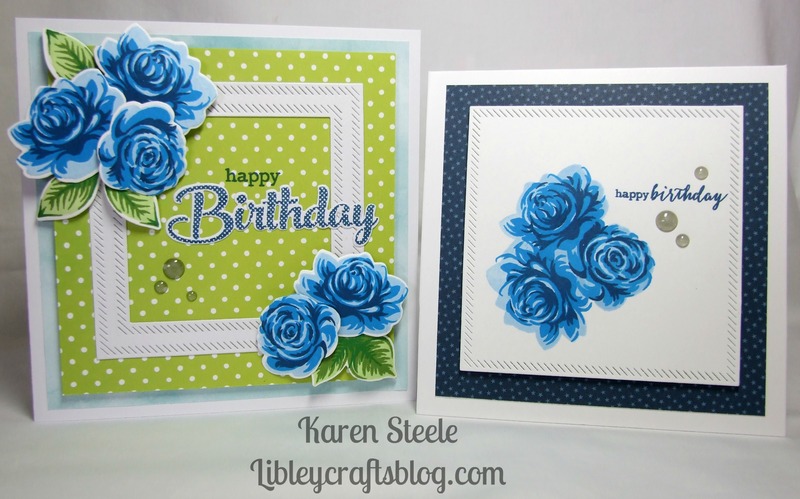 It is a really pretty layering set as you can see and these are the first cards that I have made with them. On this card I used the following materials: Memento inkpads in the following colours – New Sprout, Bamboo Leaves, Cottage Ivy, Summer Sky, Bahama Blue and Nautical Blue. Papers are by Lawn Fawn – Let’s Polka in the Meadow and My Favorite Things – Watercolor Wash Brights. Sentiment stamp and co-ordinating die from Clearly Besotted and MFT Die-namics Inside and Outside Diagnol Stitched Square Die. I also used the co-ordinating English Rose dies here. This was a really simple card. 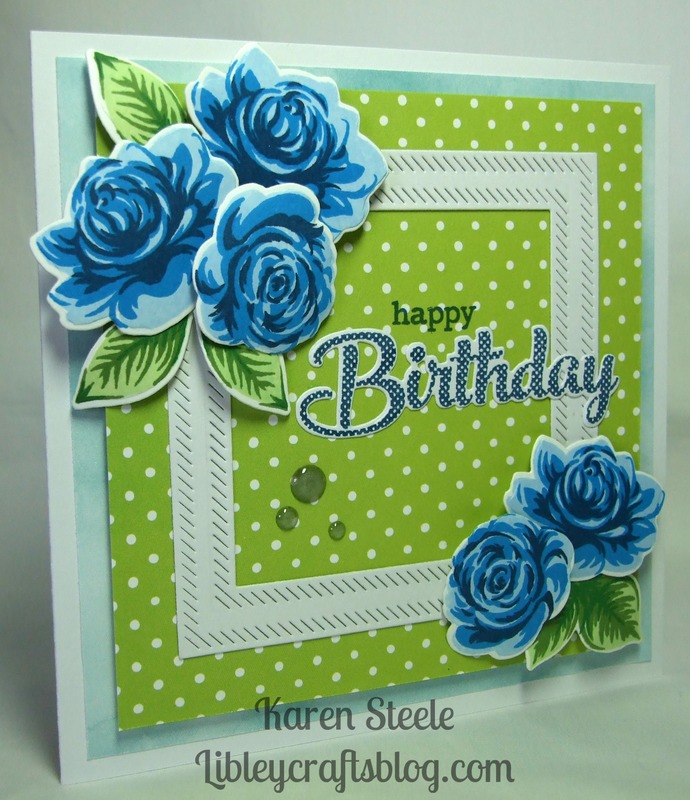 I did some masking to create this little rose ensemble and used a greeting from another of Clearly Besotted’s new releases called Message Me which includes 33 stamps! I really like the script font that they have used for part of the greeting. 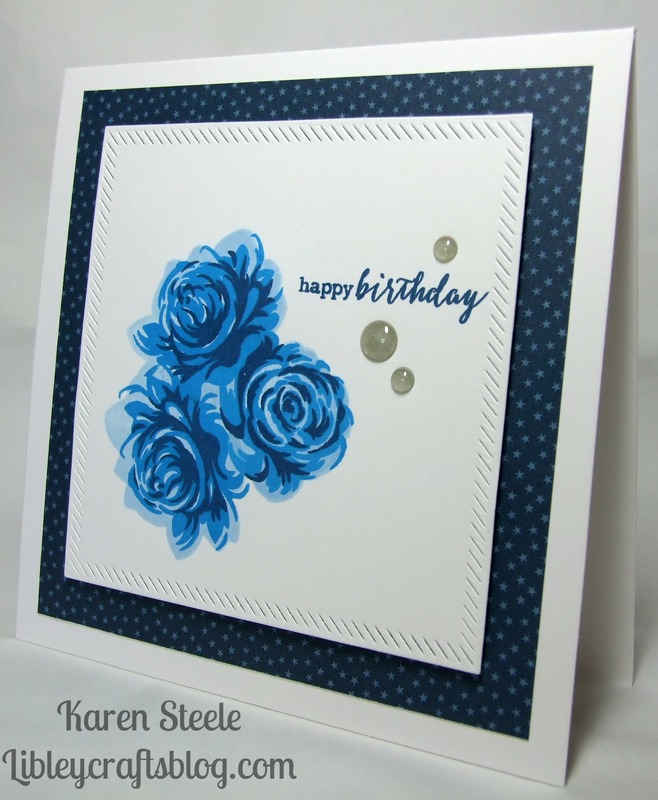 I also used the following materials: All the blue Memento inks listed above, patterned paper from Lawn Fawn – Beachside, the same MFT die as above and I also Dew Drops from Papermania on both cards. Thanks for stopping by today. I’ll be back on Wednesday with some rather cute Christmas Alpaca’s!…..
Gorgeous cards with the beautiful flowers, Karen!!! WOW! !…just WOW!! Those flowers are absolutely stunning! Wow! !…just WOW! Those flowers are absolutely stunning! Oh Karen, these are absolutely beautiful!! Love the colors!! Fantastic!! Beautiful!! I love that you went with Blue! Totally fab. The zingy lime greens work so well with the blues. Gorgeous. The alpacas sound intriguing! Oh, they’re both so lovely, one vibrant and rich of color and layers, one simple but stunning in calm colors. They both have a wow factor. Gorgeous cards, Karen! Love the blue! Ooh I love the blue flowers!